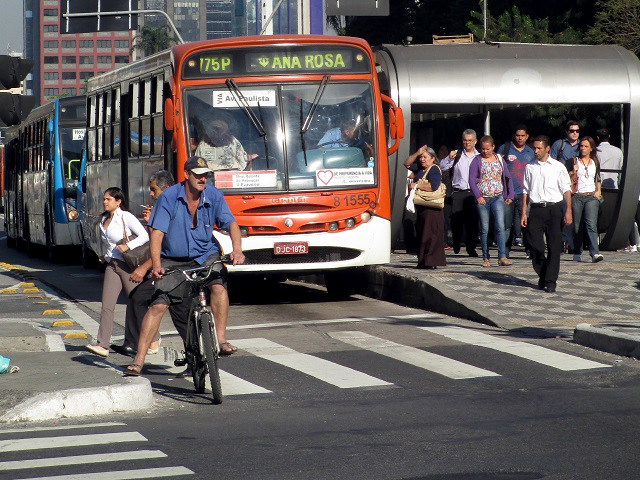 As national leaders prepare plans to curb greenhouse gas emissions at COP20, they can look to sustainable transport for win-win solutions that curb emissions while generating jobs, boosting economic growth, and improving public health. Photo by Associacao Ciclocidade/Flickr. This week in Lima, Peru, national-level decision makers, mayors, business leaders, international finance institutions, and civil society actors come together for the COP20 climate negotiations, and the world is expecting progress towards an international climate agreement expected to be reached at COP21 in Paris in December 2015. Urban transport plays a crucial role in this transformation, helping cities become major players in the global fight against climate change. As the 2014 Better Growth, Better Climate report shows, the urban population will increase by at least 2.5 billion people by 2050, and while emissions from industry are decreasing, those related to transport are expected to rise more than 50% by 2030. About 80% of this growth will occur in developing countries where rapid urbanization, emerging middle classes, and increases in private vehicle ownership are persistent trends. That’s why the question of how cities can grow through sustainable, low-carbon pathways is important in Lima. Investments in low-carbon solutions that increase the use of public transport, bicycling, and walking – while complementing connected, compact cities – contribute to a climate- and worker-friendly job market. For instance, a study from the American Public Transportation Association (APTA) shows that each $1 billion in annual spending on public transport in the United States supported an average of 36,000 jobs and prevented the emission of 80,000 tons of carbon dioxide. When also considering additional economic output, those jobs boost GDP by approximately $1.8 billion, including $1.6 billion in income and $490 million in tax revenue. By contrast, an equivalent investment in U.S. highway construction generates only 13,000 jobs on average and increases carbon dioxide emissions by 2.33 million tons per year over the usual 50-year lifetime of the highway. Similar investments in developing cities could help tap the great potential workforce in emerging economies, where an average rate of 30% of combined unemployment and underemployment leaves one-fifth of the population below the line of extreme poverty, earning less than $1.25 a day. Bogotá, Colombia – a sustainable transport pioneer – is an example of the economic benefits generated by investing in low-carbon transport. Its popular bus rapid transit (BRT) system, the TransMilenio, saves almost 250,000 tons of carbon dioxide equivalent per year while directly employing 40,000 people and indirectly supporting an additional 56,000 jobs. Furthermore, TransMilenio phases II through IV were projected to reduce emissions by around 7,000 tons of particulate matter – the main culprit behind air pollution and respiratory health problems – more than 50,000 tons of nitrus oxide, and more than 800 tons of sulfur dioxide by reducing fossil fuel consumption in the city’s public transport system. Air pollution not only diminishes quality of life in cities, but also compromises urban economies with the increased burden on health care systems. According to one recent study, the risk of hospital readmission for children with asthma was 21% higher than normal for those with high exposure to traffic-related air pollution. The United Nations Environment Programme (UNEP) states that solutions in the transport sector offer the largest potential for avoiding premature deaths related to outdoor air pollution. Particulate matter emissions in the Kathmandu Valley in Nepal have more than quadrupled since 1989, mainly due to rapid private motorization. A new policy that encourages public transport and puts vehicle emission standards in place is expected to cut carbon dioxide emissions by 20% and reduce particulate matter emissions by 47% by 2025, compared to business as usual. Reducing particulate matter concentration in the valley to a level that meets international health standards could decrease acute childhood bronchitis by 135,475 cases and avoid half a million asthma attacks per year. Those health improvements would boost the quality of life and save Nepal about $21 million annually.